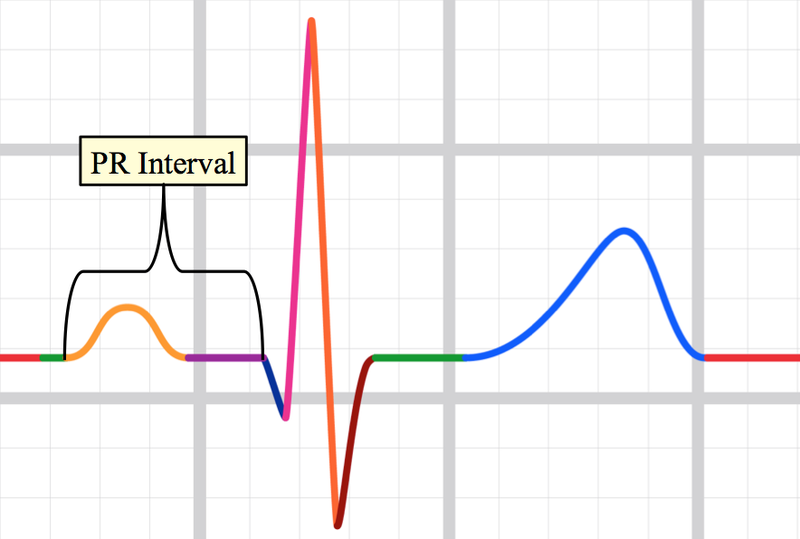 This lesson will focus on defining the waveforms and intervals. 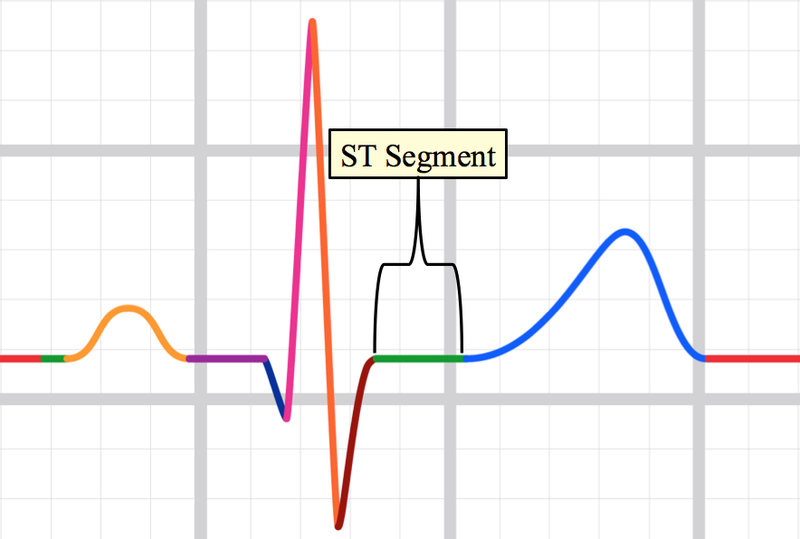 Later, we will introduce more details, such as QT interval, T wave changes, ST segment changes and many others (all of which are details not required for rhythm analysis). Here is the P wave. It is atrial depolarization. It can sometimes be very difficult to see. Sometimes it is seen in some leads, but not others. 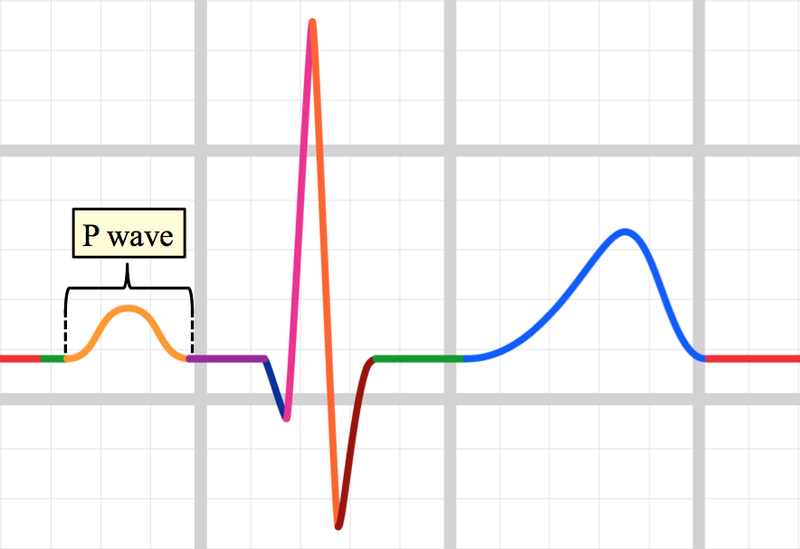 A lesson very soon will give you practice with identifying the P waves. 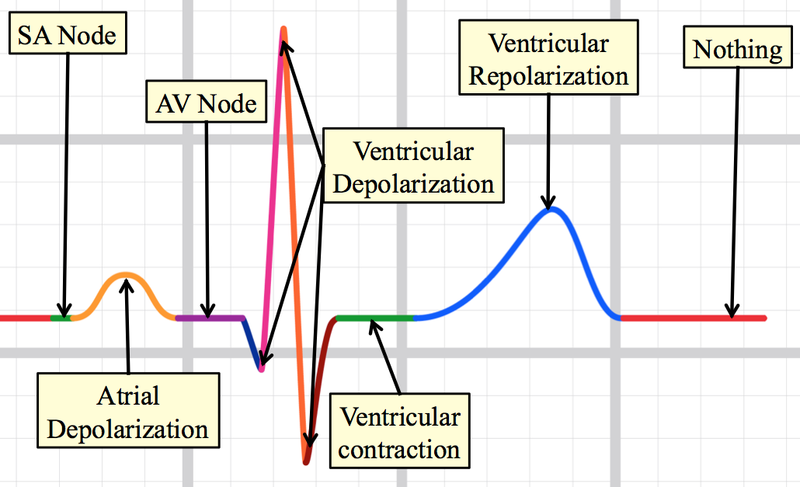 The QRS complex is ventricular depolarization. 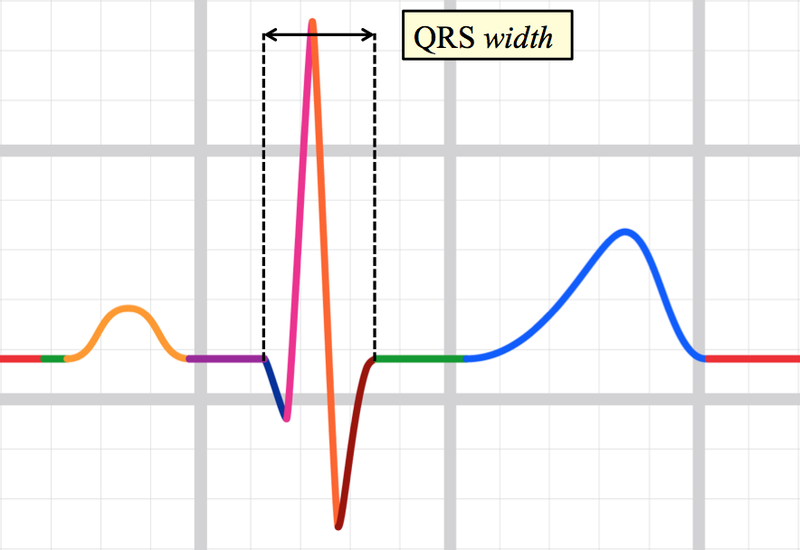 A QRS complex does not require a Q wave plus an R wave plus an S wave. In the example below, there are all 3 waveforms (down-up-down = Q + R + S). Sometimes there is only 1 waveform in the QRS complex (and this is ok) and sometimes 2, and sometimes 3 and sometimes > 3. In all instances, we still call it the QRS complex. 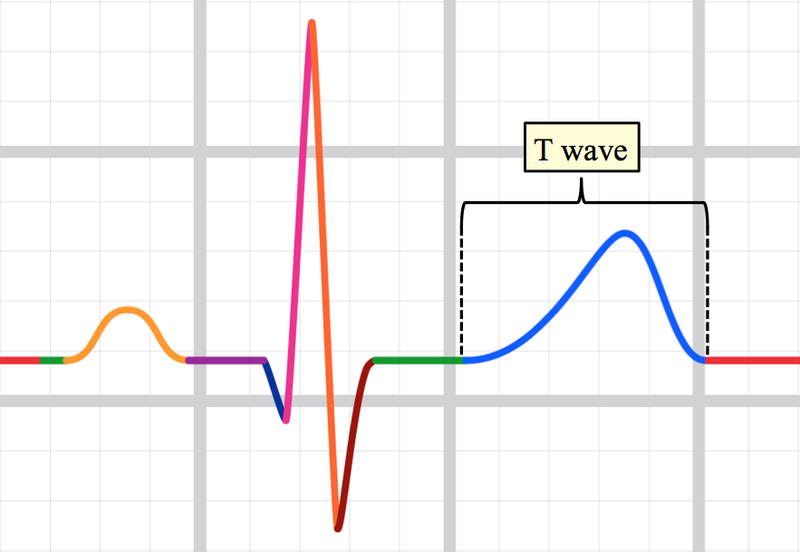 The T wave is ventricular repolarization. It is typically much wider than the ventricular depolarization that generates the QRS. Sometimes it is upside down (inverted). Sometimes half of it is upside down and the other half upright; this is called biphasic. We will not analyze those components now (but we will later). The PR interval is very very important. We will analyze it in more detail very soon. Please note: it starts at the START of the P wave and stops at the START of the QRS. The QRS duration is a measurement of how wide the QRS is. It starts at the start of the QRS and ends at the end of the QRS. Sometimes, the end of the QRS is ambiguous, so it can sometimes be difficult to know exactly where the end of the QRS is. The ST segment gets a lot of attention because it can change with a myocardial infarction (heart attack). For rhythm analysis, it is not so important; however, because it is something trainees often think about, it is being included now. All the details on this image are electrical, with the exception of ventricular contraction, which of course, is a mechanical event. 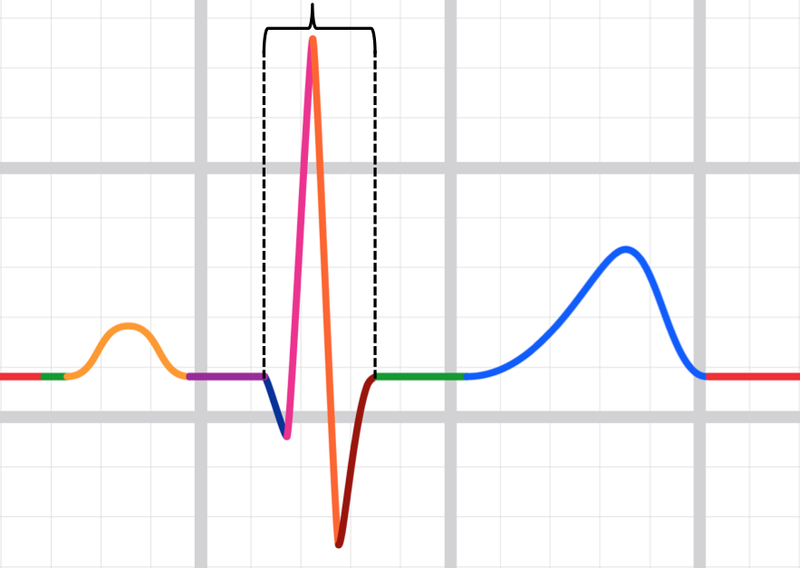 This detail is included to remind you that there is a good reason why there is a space between the QRS and the T wave. Ok ... Let's do some practice! When you click the Practice button, you can practice waveform identification. We will keep track of your score to show you how you are doing. Waveform identification skills are very important; this practice session requires that you complete at least 10 cases and score at least 80%. This is a high requirement, but without this skill being strong, your ECG analysis will be flawed. Waveform identification is sometimes very difficult. When you want to stop practicing, click Return to Lesson (brings you back here). After you practice, please go to the Next lesson. Each lesson that has practice session will have a unique number of cases and percent score that is needed to complete that lesson.